I always think it is important to set up a well balanced curriculum with strong links to the concepts you are trying to teach. 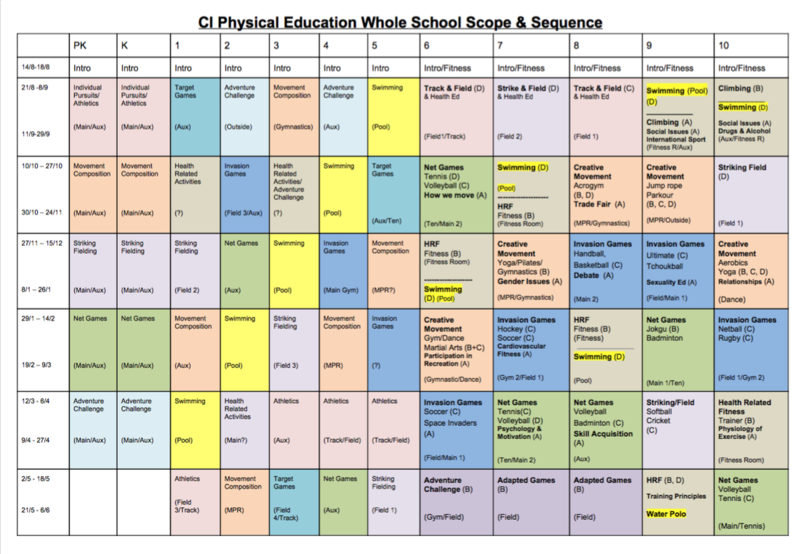 Over the years, we have established a whole school PE Scope and Sequence. As PYP and MYP grow ever more closer it is important to understand the vertical articulation of the curriculum. In MYP the Continuum is important. All subject areas should develop from PYP to DP. This is a version of our current 'Scope and Sequence'. We also do this as we share facilities and needed to establish what is being used when. We have recently added more adventure type activities in grade 6 and grade 9/10. As a PHE department in MYP, we have decided to assess each criterion 3 times during the year to give students the opportunity to be assessed one more than the recommended 2 times.